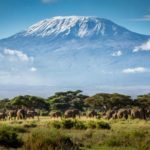 You know you are dealing with an explorer when the simple question “where do you live” gets a complicated answer. Decompressing hours on end after a deep dive was painfully boring until he learned to read underwater. Magazines and books; favorite writer is Wilbur Smith. 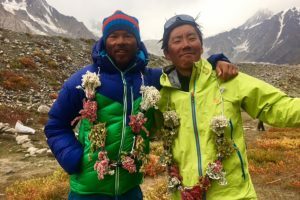 When not submerging he runs, bikes, skis, paraglides, climbs, and hikes. And uses all to work for the Tatra Mountain Rescue Service. Yesterday we spoke about the technology of extreme cave diving and how it compares to altitude climbing. Today we close with more about the clever tech man builds to go places not meant for him; how the Hranicka abyss finally offered entrance; and extreme diving in Space. Explorersweb/Pythom: What gas mixtures did you use for the deepest dives? I engineered my own dual rebreather and today I’m one of few people in the world using the gear while deep diving. Breathing air is dangerous below 40 meters – the main limit of recreational diving. Below that, one needs to customize the breathing gas mixture so it remains safe end efficient. A rebreather is a device in which breathing gas mixture flows in semi or fully closed circle. The setup is based on mixing inert gas such as helium or nitrogen with pure oxygen and an absorber which neutralizes exhaled carbon dioxide. When diving really deep, I use “trimix” (mixture of 4–6% helium with nitrogen and oxygen). I try to keep oxygen at approximate partial pressure 5 kPa in the gas mixture, corresponding to about 1.8 – 2.0 mg of dissolved oxygen per liter of medium. You must remember that oxygen is toxic when over-administered. It is crucial to adjust breathing gases to the water temperature, level of physical activity (oxygen usage increases in cold environment and while exercising), and the depth itself (some gases become useless at certain depth). Right now, I am working on utilizing hydrogen into the breathing mixture. Explorersweb/Pythom: Closed system with C02 scrubbers and some oxygen squirted in – reminds me a bit of life support on the Space Station? Krzysztof Starnawski: Indeed, the rebreathers were initially invented and engineered back in the sixties as astronaut gear. Soon after the American Navy customized it for military technical diving. Fire fighters used them as well and when rebreathers finally were admitted for civil use it was a big breakthrough for deep diving. The solution significantly decreases use of gases, but introduces other risks compared with open water scuba diving. 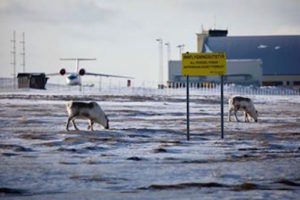 Technical complication leads to higher gear malfunction risk. There is risk of potential exposure to dangerous levels of CO2 or hyper-toxicity, not to mention the threat of developing caustic cocktail – toxic chemical – laden liquid that causes chemical burns to the tissues and may be even fatal. This may happen when water enters the loop through soaked and damaged connections. At first, rebreathers were enormously prone to breakdowns. Most of these risks have been removed and overridden by gear improvements such as silent operation; high gases efficiency allowed to extent diving time (the diver can spend days underwater without a break). These improvements were crucial for exploration of flooded caves. Explorersweb/Pythom: Seems like such small skips, 30 meters from one year to another, what was so hard? 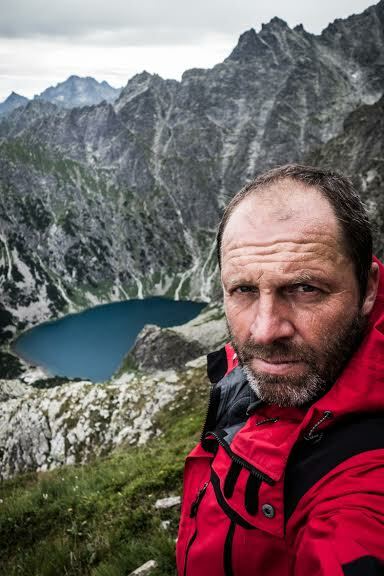 Krzysztof Starnawski: I struggled with my gear, which did not meet my requirements. The problem was solved as soon as I customized the rebreather. I also needed to assemble a trusted crew to help me with the equipment and overall preparations. And there were other things to do; my work for Tatra Mountain Rescue Service, my diving courses, different exploration projects. Moreover one can’t compare diving 30 meters at levels between 383 and 404 meters to diving at levels between 30 m and 60 m. It’s like saying that the last 30 m before the summit of K2 is a piece of cake – the last few meters are always the hardest and you had to make it there in the first place, which is not that easy. Explorersweb/Pythom: You operated the machine remotely, from the surface by a fiber optics cable. How hard was it to navigate it through the shafts, in unknown territory? 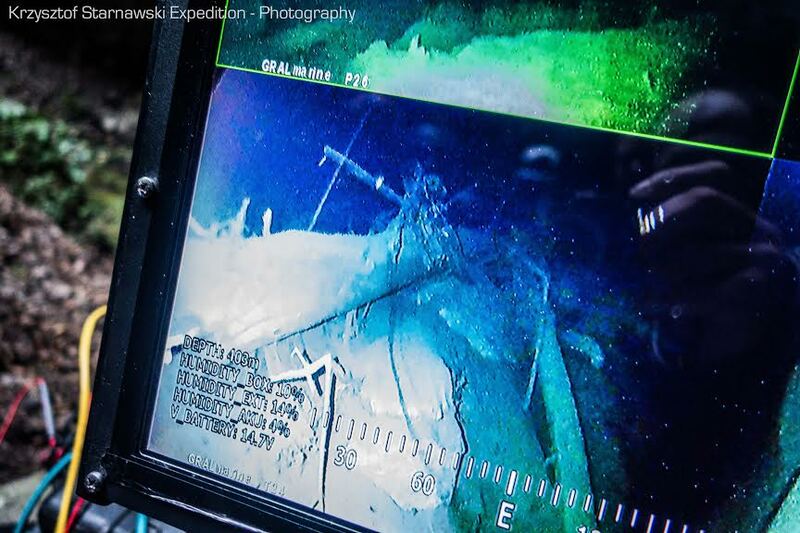 Krzysztof Starnawski: I had dived the area to 265 meters so it wasn’t unknown to me. I rope-fixed the more difficult places and the ROV (the Remote Operated Vehicle) could be led strictly down along these ropes. The device was also equipped with four independent cameras so we saw everything around it down there. Explorersweb/Pythom: You finally decided to employ the ROV from 200 meters. When it passed 392 meters you claimed world record – what record was it and shouldn’t it go to the robot? 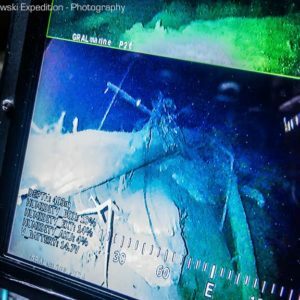 Krzysztof Starnawski: Using the ROV was unavoidable. According to the most recent scientific knowledge, it is impossible to scuba dive deeper than 350 meters due to the ambient pressure and human body endurance. This may change in the future with the use of hydrogen in breathing gas mixtures, which I’m working on. Of course it is true that I myself didn’t reach the bottom of the cave. I was merely a leader of a crew. As such I was supposed to perform the deepest and the most dangerous exploratory dives. 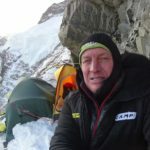 (Ed’s note: Starnawski always dove alone below 100 meters). I was guide to the technician, Bartek Grynda, who had engineered the device and managed it. The machine was just a tool that can’t accomplish much without human supervision. The record is neither the crew’s nor mine. It belongs to the cave itself. 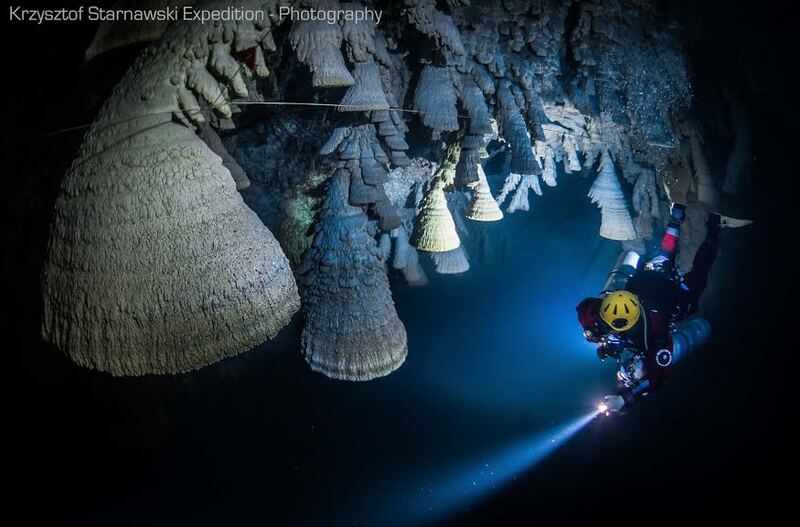 We proved that Hranicka Propast is the deepest submerged cave we know today. 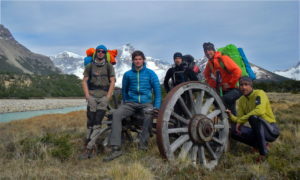 Explorersweb/Pythom: Reaching the expedition milestone – 404 meters – you found the bottom covered with fallen trees and rubble. With still some blue abyss under. Will you be back? Krzysztof Starnawski: Time will show. It will take new solutions, new techniques and certainly more money if we want to explore deeper than the next couple of meters. But the answer is Yes, I will go back, if I find a proper way to run the project. Explorersweb/Pythom: Now, a different dimension: Space probes have revealed lately that our planets and the asteroids may carry huge, insulated oceans. In 2015, data showed a global ocean beneath the icy crust of Saturn’s moon Enceladus, Jupiter’s moon Europa probably has a subsurface ocean as well, possibly Mars. Since these oceans are dark and insulated, like in a cave, possibly warmed from below like the Hranice abyss, what are chances to find life there, you’d guess? And what would be your approach to explore them? 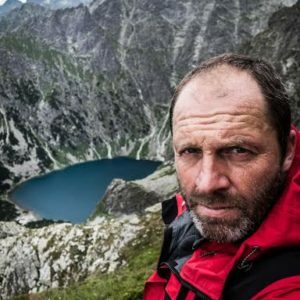 Krzysztof Starnawski: Water means life, so there is a chance of finding life there. I’m not a space engineer; so I’m not an expert in the field. What I do know is that to explore those oceans, we need to get underground and the way we have been exploring Hranicka Propast may be somehow inspiring for NASA experts. 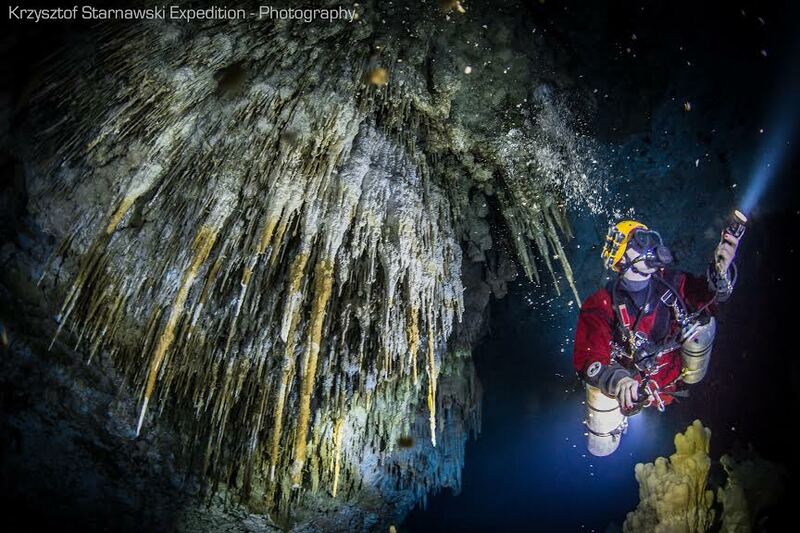 The conditions in submerged caves are more similar to Space than to Earth environment. There would be an issue of descending the drone underground through natural or drilled tunnels, probably to the same depth we were able to reach. But the right person to ask these questions is Bill Stone, who has been my inspiration in the field of explorations of both dry and submerged caves and with whom I hope to further cooperate. 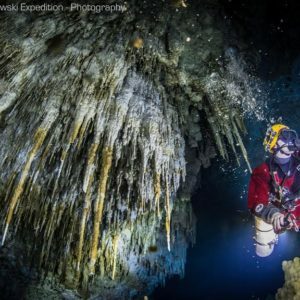 Explorersweb/Pythom: Finally: Your deepest dive yet? Scariest moment? Dream diving project? Krzysztof Starnawski: My deepest dive in open water, 283 m, took place in December 2011, while testing a newly rebuilt dual rebreather. I scuba dived 278 m in Viroit Cave, Albania in July this year. To dive deeper, I would have to rearrange my decompression template and implement changes in the breathing gas mixture. Inert gases such as nitrogen and helium might be replaced by hydrogen. Dream project? There is no particular one; I work on few of them simultaneously. When one ends or reaches a dead point, I move to the one with more favorable conditions. So, my dream is that the projects never cease but present me with more and more challenges. When it comes to exploration, the greatest pleasure, apart from discoveries, is crossing the barriers.